I was inspired to write this after reading Jeff Delp’s latest post, How do you know my name? I’ll have to back up a bit to set the story. I grew up in the bleachers at Fenway Park, went to baseball camp with Jim Rice and Butch Hobson and was pen pals with Don Zimmer, the Gerbil in 1978. The place is magical to me. In 2002, I had just completed my doctoral studies and was ABD (All But Dissertation) when I saw a full page ad in the Boston Globe looking for Fenway Ambassadors. The Red Sox were looking for people who could instill the magic of baseball. Look no further, that ad was all me! Unfortunately, hundreds of other people thought the same thing. I made it to the final round of interviews and at the end was devastated when I was told I didn’t make the final cut. They did promise that I could be part of the Fenway Force, a volunteer group when we made it to the playoffs. With Julie by my side, I turned my back and fifty-nine students ran around the room and changed places to make it hard on me. I was on fire; rattling off names at lightening speed. I did it! I knew everyone’s name on the first day. With a bit of a swagger to my step, Julie interrupted the cheering and said, “You didn’t say my name.” Trying to buy some time I said, “But, I shook your hand and called you by name…” No go. I went blank. The cheering got louder. I had to own it. Worst thing you can do in life is break a promise, especially to a child. The second worst thing is to wear a Yankees hat when you are a devout Red Sox fan. On the morning of the field trip, I was in the parking lot greeting students and parents. Everyone was looking to see if I had kept my promise. With red socks up to my knees, a Red Sox Hawaiian shirt and a newly purchased Yankees hat (which I had decorated with every Red Sox pin I could find and a red puffy paint X over the NY logo), I smiled and greeted each child by name, even Julie. The students, parents and even the teachers got a kick out of how I followed through with my promise. It was the perfect way to start a school year! Throughout my life I have never been completely positive that there is a curse on the Boston Red Sox, but now I am almost positive that there is a curse. It’s not like the Red Sox have been playing like the Detroit Tigers are playing now for the past 86 years. We have had some very good teams, just like this year. It was almost impossible to lose with this year’s Red Sox team. The Red Sox had one of the best hitting teams of all times. They shattered records and came close to matching the prestigious 1927 Yankees. How could they lose: Grady Little. The Curse was said to have begun in 1920. This was the year Red Sox owner Harry Frazee traded the star pitcher and hitter of the Red Sox, Babe Ruth. He traded Ruth to get money to fund the musical “No, No, Nanette.” Let me quote Frazee, “I think the Yankees are taking a gamble… The Boston club can now go into the market and buy other players and have a better team…than if Ruth had remained with us.” Frazee couldn’t have been more wrong. Since then the Red Sox have lost in seven games every time they went to the World Series, a total of four times. The Yankees have won twenty-six times since then. Every time the Red Sox have been to the World Series they lost in heartbreaking fashion. Rumor has it that in Ruth’s last year with the Red Sox he was up at his house on a pond in Sudbury, Ma. He was very angry and shoved his piano into the pond. Sox fans have dived into the pond to try to resurrect the piano and refurnish it. They believe that if they restore the piano the curse will be broken. Many Red Sox fans will deny that there even is a curse. The mass popularity of the “Curse” began in the 1990’s. A Boston Globe writer named Dan Shaughnessy wrote a book where he stole the Curse of the Bambino from a preacher. His book became a best-seller and made him famous. He still brings up the Curse the most in his articles. Bill Simmons, a writer for ESPN the magazine, a huge Red Sox fan does not believe in the curse, in fact he thinks it complete nonsense. In the only article he ever wrote about the Curse a few years ago ends this way, “Believe me, don’t believe me…whatever. I don’t really care. Just understand that I’m never mentioning the “Curse” again in this space, for the reasons laid out above. And in the words of the immortal Forest Gump, ‘That’s all I have to say about that.’” This is very ironic because Grady Little, the manager who blew it this year, sounds exactly like Forest Gump. On September 11, 1918 the Red Sox won their last World Series against the Chicago Cubs. The Cubs hadn’t won since 1908 and still haven’t won. In 1923 the Yankees won their first of twenty-six World Series. In 1935 Ruth returned to play for Boston, but with the Boston Braves. He only batted .181 and only hit 6 home runs. Four specific events in Red Sox history that can support the idea that there is a curse are: Johnny Pesky’s bad fielding decision, Bucky Dent’s homer, Bill Buckner’s error, and the end of the 2003 American League Championship Series. The first event happened during the year of 1946. It was the first time the Red Sox had made it to the World Series since 1918. It ended the miserable times the Red Sox had been having. The Red Sox made it to game seven against the St. Louis Cardinals. The Red Sox came back from losing 3 to 1 in the top of the eighth. Then in the bottom of the eighth with a man on first Harry Walker hit a ball over Johnny Pesky’s head. Pesky got the ball, but for some reason held onto it. While he waited to throw the ball the winning run scored. In the top of the ninth the Red Sox threatened but never scored. Then in 1978, the Red Sox had a chance after they had lost in the 1975 World Series. Entering August the Red Sox had a fourteen game lead over the Yankees. They blew their giant lead and at the end of the regular season and they had to play a one game playoff with the New York Yankees. The Red Sox were up 2 to 0 in the seventh inning. Bucky Dent, the twenty-six year old short stop of the Yankees who had ninety-two hits the whole season stepped up to the plate with two men on. Mike Torrez threw the ball and Bucky put the ball up and over the Green Monster to take the lead 3 to 2. The Red Sox eventually lost the game 5 to 4. In that game the coach of the Red Sox was Don Zimmer. The Yankees eventually went on to win their twenty-second World Series. In 1986 the Red Sox went to the World Series again. The Red Sox were one strike away from winning the World Series. They were playing the Mets in Shea Stadium. The Red Sox bullpen gave up two base hits and then the third baseman drove in a run. A wild pitch brought in the tying run. Mookie Wilson fouled a few balls off and the count was full. He hit a slow ground ball towards Bill Buckner at first. Buckner bent down ready to scoop a routine ground ball and bring the game into the eleventh inning, but the ball went through his legs and the Mets won! It is the biggest and most infamous error in World Series history and of course it happened to the Red Sox. Thursday, October 16, 2003, in the eighth inning Pedro came out of the dug out to pitch. All of Red Sox nation knew it was a terrible decision. Everyone just watched the season blow up. The game plan was to have Pedro pitch seven strong innings then go to Timlin in the eighth then Williamson in the ninth. Pedro stayed in. After giving up a few hits, Grady came out to the mound, but left Pedro in. Pedro was pitching on fumes and he blew the lead. In the eleventh inning Aaron Boone hit a walk-off homerun against Tim Wakefield, a knuckleball pitcher. Who in there right mind would expect a knuckleball to work at midnight on a cold night? Only, Grady. Aaron Boone added his name to the list of people whose name started with a B that have made the Red Sox lose: Babe, Bucky, Buckner, and now Boone. Do you believe in the curse? Now I do. How can you describe an eighty-six year championship drought when you have had some awesome teams and golden opportunities? The Red Sox have had many opportunities to “reverse the curse” but something always happens. It’s not like we have been blown out in the World Series every time. It’s always been close. We loose it on a questionable managerial decision, a bad fielding play, or a big play by the other team in the clutch. You can decide for yourself, are the Red Sox cursed or do they just always choke in the clutch? 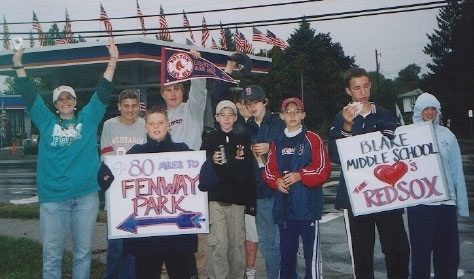 From the first day of school, the Boston Red Sox (and the Yankees hat) had helped make our middle school a community. All sixty students were involved and interested in the playoffs. I remember parents asking me, “What have you done? My daughter took the sports page this morning to check the scores before coming to school…” Baseball fever was running rampant in our middle school. It didn’t matter if you never followed baseball before or if you were a Sox fan or a Yankees fan or neither. What happened was magical. We united as a school because of a bet made on the very first day. Just prior to the American League Division Series, I received an email from the Boston Red Sox. They needed me! I was asked to attend a meeting that night at the .406 Club to learn all about my Fenway Force assignment. I called an all school meeting and the students went wild! I rushed off to Fenway prepared to instill the magic of baseball during the Red Sox vs. Yankees Series. When I received my assignment, I was crushed. I was assigned the day before the game to greet fans at Logan Airport. Boy, were they misusing my talents I thought. I didn’t think I’d be in the Park, but I was hoping to be on Yawkey Way the day of the game. Driving home that night, I came up with my own game plan. Unfortunately, baseball season ended for us that October when we lost to the Yankees in Game 7 of the American League Division Series. 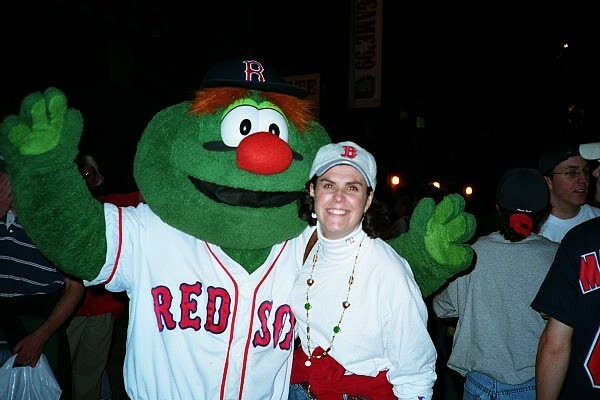 As a middle school we echoed those famous words, “Wait ’till next year!” I proudly dressed in a cardboard box painted green like the “Green Monstah” for Halloween. By the end of the year, our eighth graders wanted to go to a Sox game. We took the last Fenway tour before the game started and watched batting practice from the “Monstah” seats. It was one of the best teaching years of my life because everyone was involved in making history – it didn’t matter who won or who lost. We built our school community around the magic of baseball and getting to know everyone’s name on the first day. Despite our differing opinions about baseball…. this story makes me so happy!!! You’re so great! Never change!